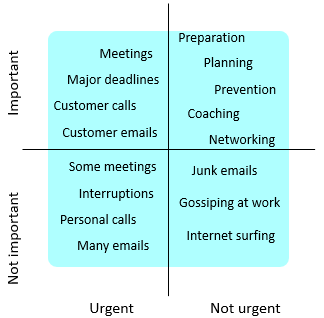 The Importance Urgency Matrix, or the Eisenhower Method, is an effective method for organizing priorities. It is a two-dimensional chart that is used to prioritize work activities as well as personal activities. It can be used when the team is having a conflict and unable to manage the work effectively. All activities can be evaluated in terms of importance and urgency. They are then placed in the appropriate quadrants of the matrix. Quadrant 1 is for important activities that require immediate attention. 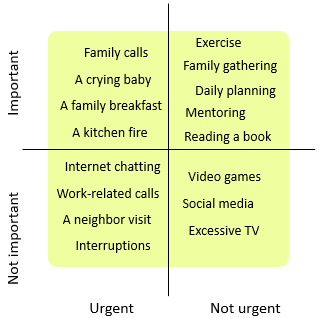 Quadrant 2 is for activities that are important but not urgent. 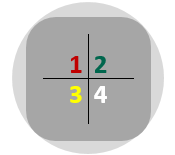 Quadrant 3 is for activities that are not really important, but someone wants it now. Quadrant 4 is for activities that are neither important nor urgent. Quadrant 1 is for important and urgent matters. A problem may arise when unexpected activities arises, or when activities become urgent due to procrastination or poor planning. It is recommended to leave some time in your schedule to handle the unexpected activities. Be proactive and avoid procrastination and taking more time than needed doing the important work. Some examples of activities that are found in this quadrant are: deadlines at work, projects at hand, medical emergencies and performing urgent repairs. Quadrant 2 is the area that you should spend most of your time on. It is exceptionally important when it comes to personal development and growth. It also includes activities such as: planning, prevention and leadership driven activities. These activities are often under used, and finding ways to expand them is the main goal from using this matrix. Athletes, entrepreneurs and other people of great achievement find time for this quadrant. Activities in Quadrant 3 are unimportant and are done with a sense of urgency. Most of these activities are draining and time consuming. Examples of activities that are found in this quadrant are: most emails, some meetings, some phone calls, frequent interruptions, unwanted conversations and agreeing to something because you can’t say “no”. Push back, delegate, or at least don’t get caught up with these activities. Quadrant 4 is the area that most of us get caught up in. It is for those activities that are often used for taking a break from important and urgent activities. For example, watching your favorite TV show can be a relief at the end of a long day. The key here is to limit how much time you spend in this quadrant. Otherwise, you will lose control of your future and may decrease your chances for success. Begin by your personal or job-related activity list. Draw the importance-urgency matrix on a paper (or on a flip chart if you are working with a team). Sort all the activities in the appropriate quadrant. Manage what’s on the first two quadrants, and pushback or ignore what’s on the last two quadrants.